Khaleghifar, N., Sariri, R., Aghamaali, M., Ghafoori, H. (2017). The Effect of Ramadan Fasting on Biochemistry of Saliva. Journal of Applied Biotechnology Reports, 4(2), 583-586. Narjes Khaleghifar; Reyhaneh Sariri; Mahmoodreza Aghamaali; Hosein Ghafoori. "The Effect of Ramadan Fasting on Biochemistry of Saliva". 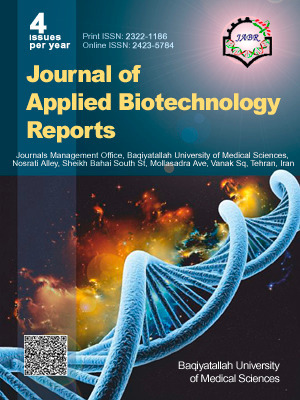 Journal of Applied Biotechnology Reports, 4, 2, 2017, 583-586. Khaleghifar, N., Sariri, R., Aghamaali, M., Ghafoori, H. (2017). 'The Effect of Ramadan Fasting on Biochemistry of Saliva', Journal of Applied Biotechnology Reports, 4(2), pp. 583-586. Khaleghifar, N., Sariri, R., Aghamaali, M., Ghafoori, H. The Effect of Ramadan Fasting on Biochemistry of Saliva. Journal of Applied Biotechnology Reports, 2017; 4(2): 583-586. Muslims fast every day from down to sunset during the holy month of Ramadan. The possible side effect of Ramadan fasting on general health has been widely studied, but oral health may also alter due to one month fast affecting some of the salivary secondary metabolites. The aim of present research was identifying the influence of fasting on saliva of healthy individuals. The subjects were selected from non-smoker male employees of one factory in Rasht. 35 healthy male (aged 30-50 years), who fasted the whole Ramadan entered. Their unstimulated saliva samples were collected before, during and at the end of Ramadan. Concentration of salivary uric acid, the activity of alkaline phosphatase (ALP) and aspartate aminotransferase (AST) were then measured using spectrophotometric methods according to procedure given for serum. The results showed a significant reduction in the concentration of salivary uric acid and AST, while the activity of ALP was significantly increased. It was concluded that some of salivary biochemical markers undergo various fluctuations in response to fasting. However, more studies with a larger population and various biochemicals are required to certainly comment on the matter.